Holiday decals are a quick and affordable way to personalize your home for the holidays. Your favorite scripture or phrase created into a decal. Use our easy to use custom pricing program to create your phrase. Vinyl lettering decals are a very easy way to transform a room, in about ten minutes time. Vinyl lettering will stick to most smooth surfaces and when complete, you must touch it to tell it is not painted on. The colors are fantastic, and the possibilities are endless. We offer custom lettering, that allows you to pick your own font, your own size, and your own colors. You may express yourself as only you would desire. 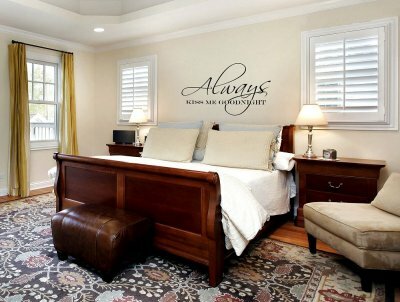 Custom lettering is often used to personalize a space with scripture, poems or fun phrases. If you are stuck on ideas, we have lists of ideas that clients have used to help get your creativity flowing. Businesses often use custom lettering for either motivational purposes, or to brand their space with a logo or business specific names. If you are in need of custom logo work, please contact us, we provide custom logos for both vinyl lettering, and for stenciling. We can help you decide which is best for you. We offer our most popular phrases artistically styled. These are often used in bedrooms, family rooms and entry ways. Multiple sizes are often available, and if you need a size that is not listed, please contact us, and we will work with you to provide what you want. All of our products come in the most popular colors, but if you have a special need, that does not seem to be met with one of the colors provided, let us know, we have many more colors available. Monograms are a simple way to personalize a space. We offer a variety of styles for monograms, which can be personalized with a person's name, initials, or even a wedding date. Our styles include sports, fancy, and classic looks. Vinyl lettering decals are great for growing children. When your child outgrows the words, or the style appied, the decoration can be carefully peeled off the wall, and a whole new expression or style can replace it. 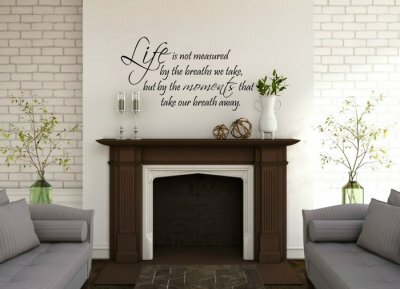 If you have wall treatments that you do not want to paint on, or otherwise create a permanent decoration to the area, vinyl lettering stickers take the worry out of decorating. Classroom teachers can even decorate, knowing the administration is happy that the work is not permanent.